Providing a safe environment has been one of the core tenants of TraPac’s operating philosophy since we were founded more than 30 years ago. Each year, TraPac’s Los Angeles and Oakland terminals handle 1.5 million TEUs of import and export cargo for our customers, ranging from refrigerated products to auto parts and everything in between. As cargo volumes continue to increase, TraPac is pioneering innovation that will enable us to continue moving cargo through our terminals quickly and safely. In order to ensure the safe transport of our customers’ cargo as it enters and leaves our terminals, TraPac has implemented a number of technologies and policies. TraPac conducts regular accident prevention and response training with stakeholders that work in our terminals. TraPac’s terminals are surrounded by secure access gates around our landside operations so that we can regulate entry in and out of the property. Additionally, we have a security staff that patrols all zones of the terminals on the ground and via a state-of-the-art camera system 24 hours a day, 7 days a week. Before entering our property, all trucks must be enrolled in the Port Drayage Truck Registry and obtain a Radio Frequency Identification (RFID) tag. Our gates are equipped with RFID tag readers to ensure that only approved trucks gain access, as well as to verify that all trucks comply with current safety and environmental requirements. 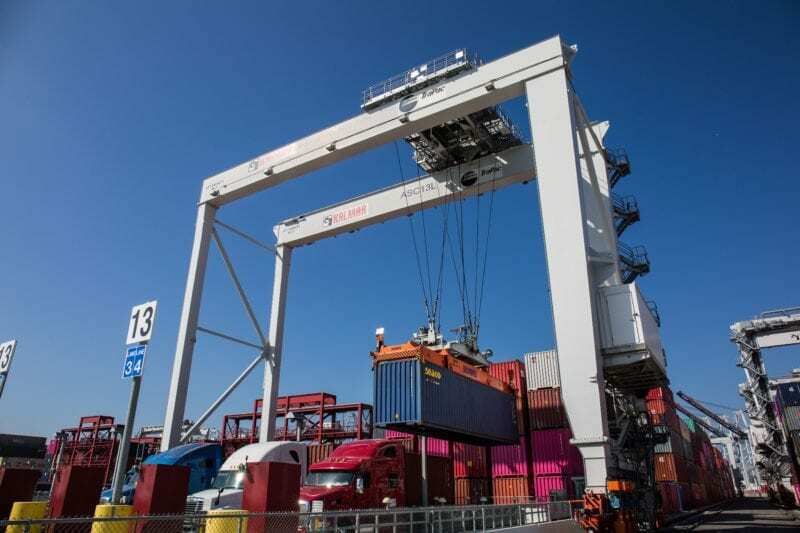 To maximize productivity while maintaining the highest safety standards, TraPac’s Los Angeles terminal uses a combination of electric and hybrid automated straddle carriers, automated stacking cranes, and rail mounted gantry cranes for on-dock rail. The fully automated process, which occurs behind a fenced in area, minimizes the potential for human error and improves safety, helping TraPac avoid unexpected interruptions that impact productivity. TraPac’s Los Angeles terminal automates a terminal’s landside operation for safer and more efficient service. Upon entry to the terminal, the driver is provided a designated lane number. The driver proceeds to the lane, where they then step out of the cab to wait in a secure access booth. A sensor inside the booth lets the crane operator know that the driver is safely inside and it’s safe to proceed. The driver is directed to pull into a designated lane, where they step out of the cab to wait in a secure access booth while the container is lowered to or picked up from the chassis. This integrated system enables containers to be available for pick up within 15 minutes of being unloaded from a ship, which has significantly reduced truck turn times and reduced idle truck emissions. 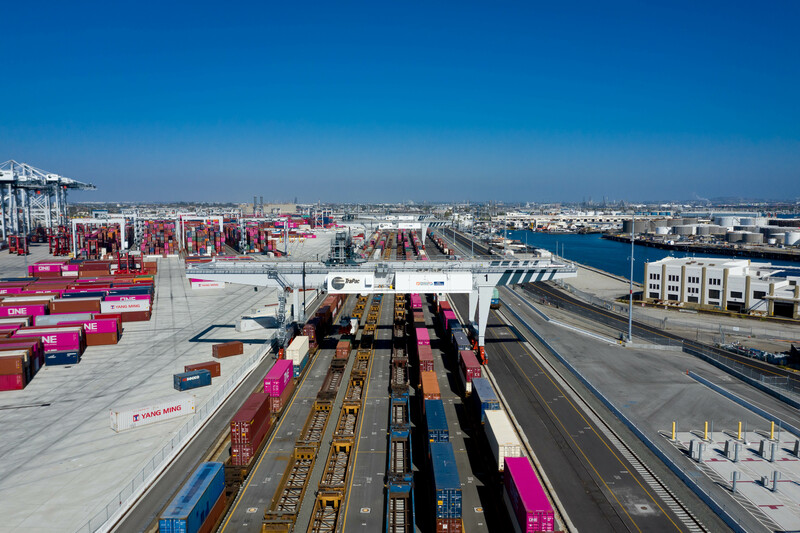 TraPac’s Los Angeles terminal was the first to collaborate with U.S. customs and Border Protection to move containers through the radiation portal monitoring system without taking the containers out of automation before being loaded onto our on-dock rail. The system enables TraPac to quickly process cargo without compromising on safety.